Salmon is our family’s favorite main dish (including the kids!) When salmon is cooked perfectly, there’s nothing better! It always surprises me when I’m chatting about food with a someone and they tell me they’ve never tasted salmon before. 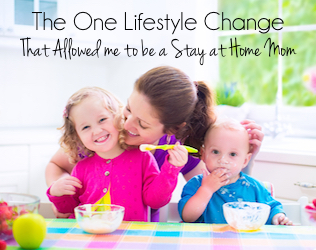 Most of the time it’s because they’re not sure how to prepare it – or think it’s too complicated to do at home. However, with our “secret” trick to cook perfect salmon, there’s no excuse not to give it a try! Keep reading for photo step-by-step instructions, or click here to jump to printable recipe at bottom of post. Why Salmon? Salmon is a wonderful addition to your weekly meal plan — it’s delicious and full of nutrients (Protein, Omega 3s, Vitamin D, and good fats…just to name a few). Isn’t salmon expensive? It doesn’t have to be! If you stock up when it’s on sale, you can snag this premium protein at an awesome price! Our family cooks salmon once a week, but we never pay full price. What can I serve salmon with? 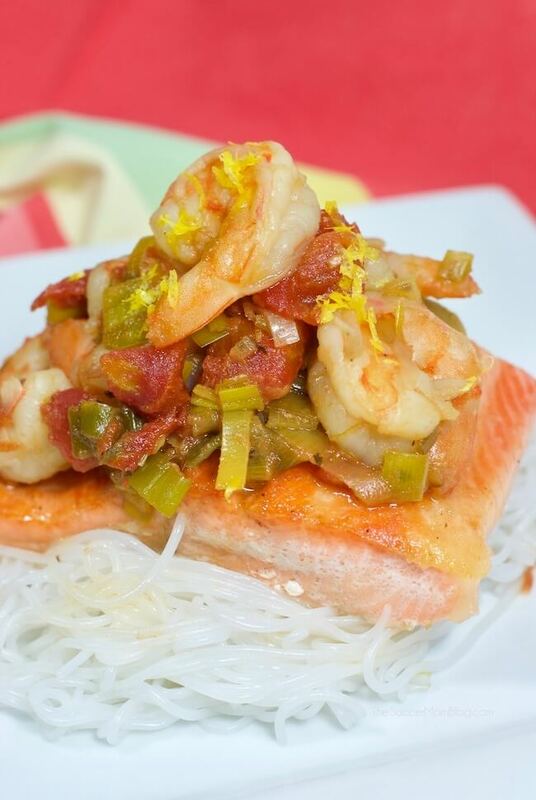 My husband prepares salmon with a variety of seasonings and sauces (one of our most-loved recipes is Citrus Leek Salmon and Shrimp, pictured below), and it is perfect. Every. Single. Time. I’ve included links to more of our favorite salmon recipes later in the post too. The key isn’t what you flavor your salmon with – the trick is how you cook it. 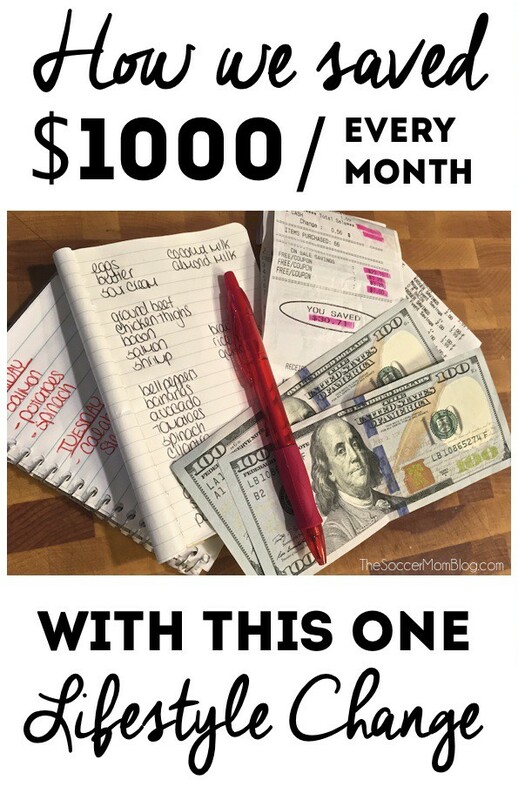 This method is literally foolproof. Follow the steps below and you’ll end up with salmon that rivals what is served in fancy restaurants! Grab a free printable copy of this recipe for restaurant style salmon at the end of the post. PS- I’ve included shop-able ad links to products we love and use for our pan-seared salmon recipe; disclosure policy available here. STEP 1 – To start, lightly salt and pepper your salmon filets (about 6-8 ounces each). STEP 2- Place salmon filets skin side up on a lightly greased Frying Pan over medium heat. (We love and use coconut oil for most of our cooking projects, though you may use any cooking oil you prefer). 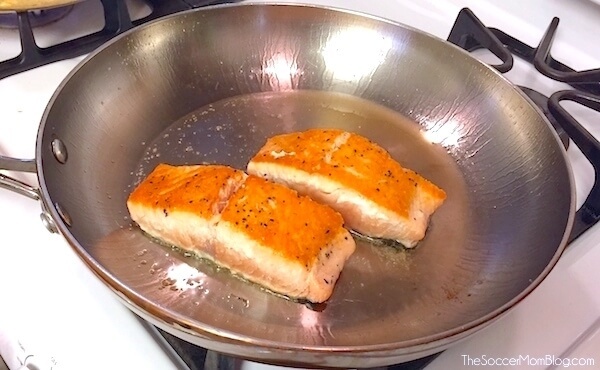 Give the pan a little shake right after you put on the salmon, so they are sure not to stick. Pro Trick: My husband says: HOT pan, COLD oil — make sure the pan is heated and ready to go before adding oil (this will help prevent sticking). STEP 3- Once salmon is cooked halfway through, flip so skin side is facing down. You will see a distinct line in the middle of the filet when it’s time to flip (about 7-10 minutes). Look at that beautiful crust on top — yum!! STEP 4- Turn off heat, cover, and let salmon filets steam ten minutes for medium doneness. (If you like your salmon medium-well, add 2-3 extra minutes). Super easy, and pretty much foolproof — hey, if I can cook perfect salmon, anyone can! Related: Now that you know how to cook perfect salmon, try this recipe for Pan-Seared Salmon with Thai “Secret Sauce” — it’s light, healthy, and delicious! A fish spatula (yep, it’s a thing!) will help you turn the filets with ease. We also love these locking kitchen tongs — they’re the perfect length and the locking design makes them easy to store. (We have these extra long tongs for outdoor grilling too). Want to Remember How to Cook Salmon Perfectly? 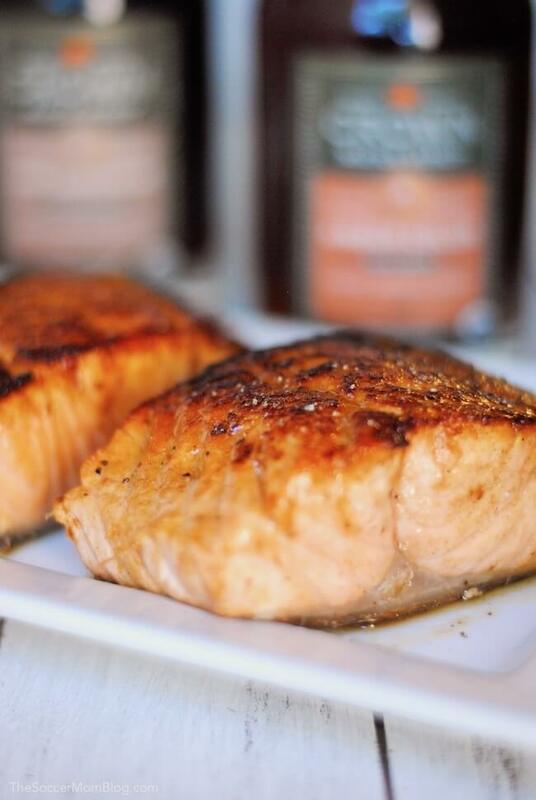 Bookmark this page or print our free copy of this pan seared salmon recipe below! PS- If you love this recipe, rate it! A foolproof method to cook perfect salmon every single time! 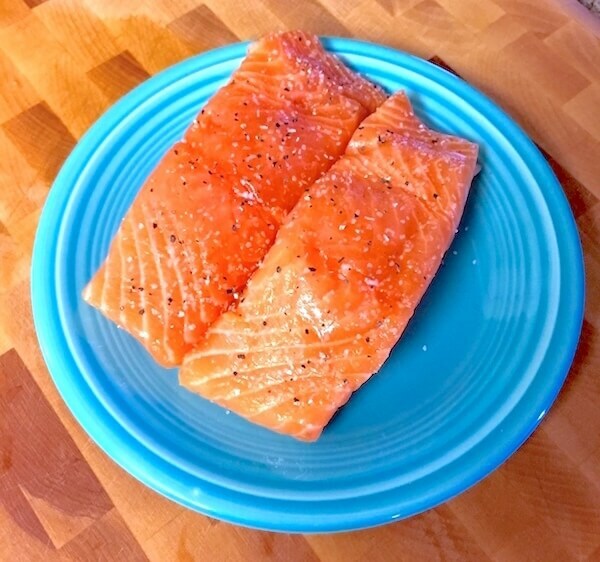 Lightly salt and pepper salmon filets. 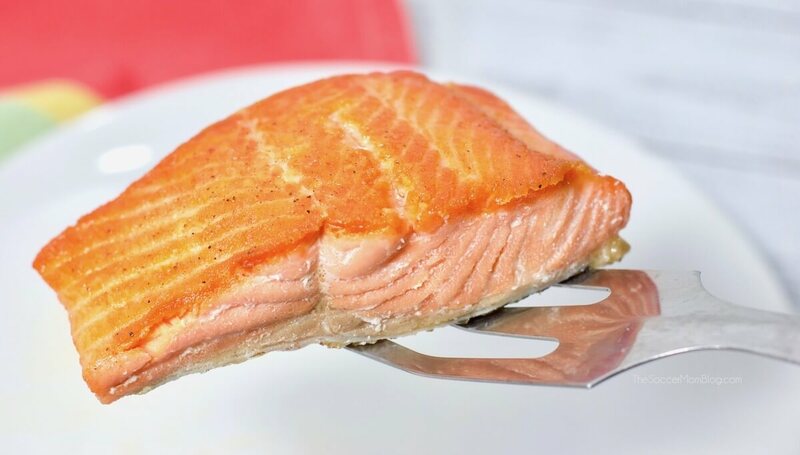 Place salmon filets skin side up on a frying pan lightly coated with coconut oil (or cooking oil of your choice). Make sure pan is hot before adding oil. Once salmon is cooked halfway through, flip so skin side is facing down. (You will see a distinct line in the middle of the filet when it's time to flip (about 7-10 minutes). Turn off heat, cover, and let steam ten minutes for medium doneness. (If you like your salmon medium-well, add 2-3 extra minutes). 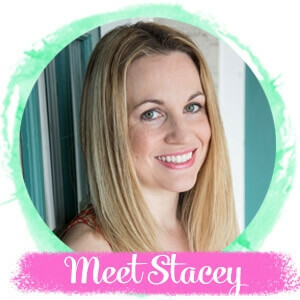 Follow my recipe board on Pinterest to get the very latest and greatest from the Soccer Mom Blog kitchen! Want to switch it up? 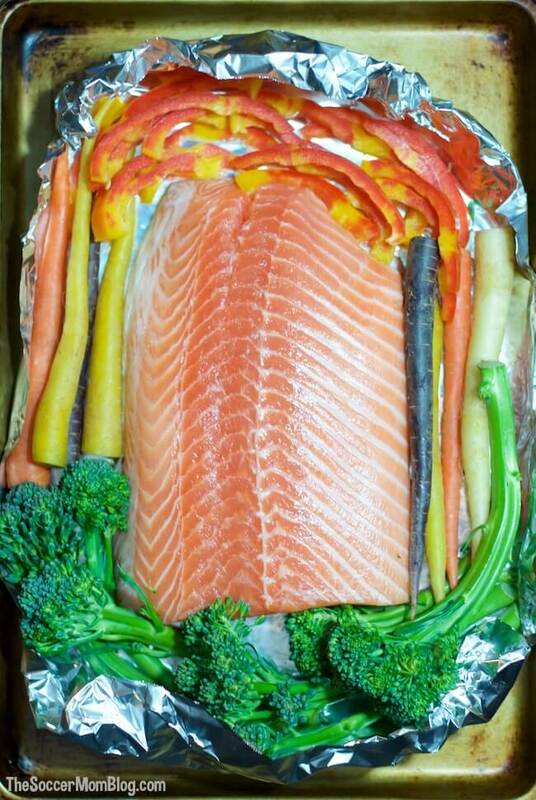 Find out how to bake salmon in foil for an easy weeknight dinner! 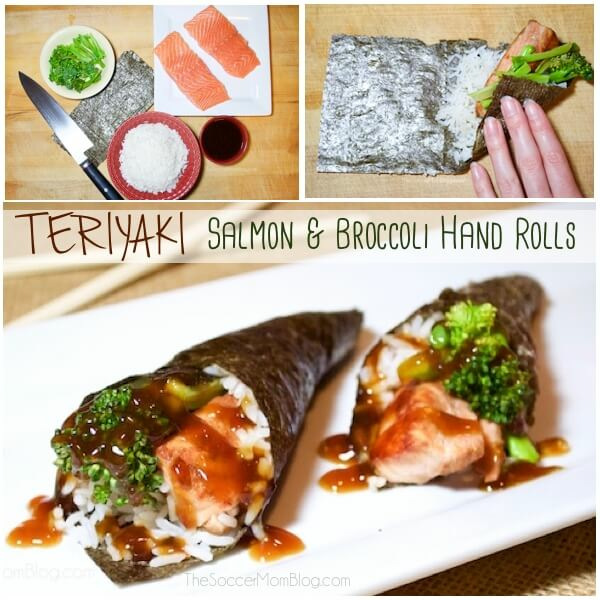 Try it sushi-restaurant style with our Teriyaki Salmon Hand Rolls! This turned out amazing!!!! Thank you! Awesome Sandy! Thanks for letting me know! Looks easy. But I’m almost more interested in the dish photoed at the top of this page. What’s the sauce over the fish (with the scallions and shrimp)? I’ve never replied before. But I have to say this is the Salmon to Perfection. Un-f@#$&-believable deliciousness. Thank you!! Oh my gosh! I loooove salmon and always order it in restaurants, but I never make it at home because I’ve dried it out before and that seemed like such a waste. This was SO easy and tastes better than some I’ve ordered in restaurants. I will definitely be buying salmon regularly now. Thanks a million! I love salmon but never was able to successully cook it, until now! Thank you for the simple way to cook it on the stove top. I pinned this and will be referring to it again. WOW! I mean seriously WOW! This really does make the perfect salmon. Thank you so much for this post. 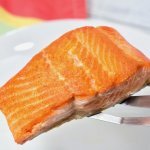 We’re starting to incorporate salmon into our meals more and more and this simple technique has turned my attitude from grumble grumble to NOM NOM! Looks delicious! When you “steam” the salmon, is it covered? I’ve never cooked salmon before and I plan on making this tonight but do I leave the skin on or take it off?! And if I do take it off, how?! We always leave the skin on and remove before serving. 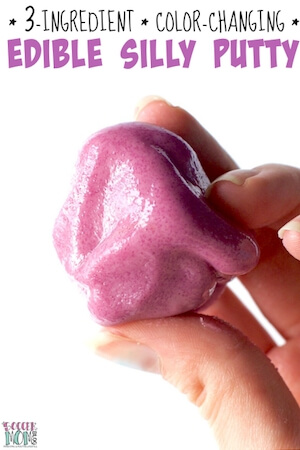 You can slide it right off with a spatula easily once it’s cooked. Enjoy!! I just made this and it was awesome. Salmon has never been my favorite, but my hubs and son love it. I never really knew a good way to prepare it, so I would just bake and/or broil it. And it came out eh, ok. But this method was amazing! So simple to follow, and the crust made all the difference. iI served it over some fresh spinach and kale, and with some fried rice. So glad I found this post. Now I love salmon! This is not how you cook salmon ‘perfectly.’ You can see in the pictures that the albumin (chunky white stuff) is coming out of the salmon. It was cooked too quickly at too high of a temp. This technique is how you OVERCOOK the heck out of salmon. Hi Andrea — While I appreciate all respectful feedback, from your comment it doesn’t sound like you have actually tried this method before offering your critique. Many other trusted food sites (The NY Times, for example) do recommend cooking quickly at high heat when sautéing salmon. I prefer my salmon done medium, and this technique works every time. So do I put the salmon in right after the coconut oil melts? And also, is it best the salmon is at room temp or can I cook it straight outta the fridge? Awesome! Thanks so much:)) I can’t wait for dinner tonight!!! I would never cook salmon any other way that on a charcoal grill. but this method should still work. You can– the filet will cook quicker without the skin as a barrier. Try shortening the cooking time by half. For electric stovetops, when turning off the heat and covering the pan to let the salmon steam, do you leave the pan on the turned off heated plate or take it off while it is steaming? Hi Jill – when you turn off the heat, it’s still a good idea to move the pan to a cool part of the stove to prevent overcooking your salmon. Hope this helps! Yay!! Glad you loved it – thank you for letting me know! The salmon turned out fantastic and as good as any restaurant. 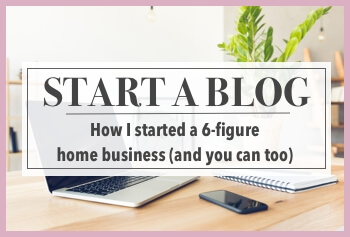 Its so quick and easy! Yay!! I’m so glad that you loved the salmon! Thank you for letting me know! Do you eat the skin as well? Or do you suggest removing it after cooking it? I usually remove the skin after cooking when we prepare our salmon with this technique. Thank you for sharing. Followed your recipe. Cooked 8-9 min, turn over and covered. Excellent. I just made sauce … pan drippings , lemon juice, orange juice, minced garlic , fine chop red onions n red bell pepper, I didn’t have white wine so I used a little water, little honey, salt pepper let it simmer. Very good.. Served with cooked fresh spinach w/ garlic, roasted potatoes.